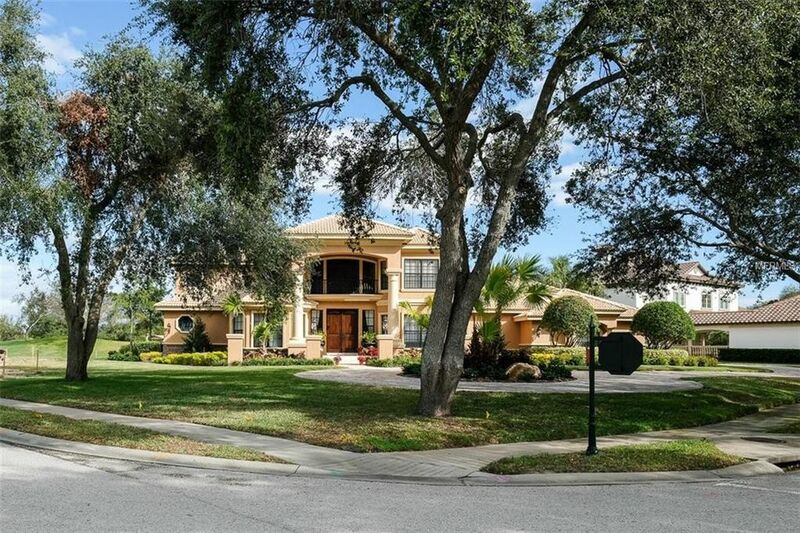 MAGNIFICENT "RESORT STYLE LIVING" IN FAMED "HIGHLANDS OF INNISBROOK"...PALM HARBOR'S PREMIER GATED COMMUNITY! OUTSTANDING CUST BUILT "CONSTANZA" HOME LOCATED ON THE 7TH GREEN ON THE SOUTH COURSE! FABULOUS FRONT ELEVATION W/STONE ACCENTS & TILE ROOF! ENTER THRU THE CUST MAHOGANY ENTRY DOORS TO SOARING CEILINGS, PILLARS, COFFERED CEILINGS, MAGNIFICENT 2 STORY FORMAL LIV RM. W/CUST STAIRCASES, DESIGNER LIGHTING FIXTURES THRU-OUT, CUST PAINTED WALLS, CHEF INSPIRED KITCHEN W/CTR ISLAND, 42" CUSTOM STAGGERED CABINETRY,KITCHEN AID APPLIANCES,GRANITE COUNTERS,HUGE PANTRY & BUILT-IN DESK.BREAKFAST RM W/ DESIGNER WALL ART,DECORATIVE CHANDELIER,VIEWS TO POOL & GOLF COURSE.SPACIOUS FAM RM OFFERS A GORGEOUS STONE ACCENT FIREPLACE,BUILT-INS,WET BAR FINISHED W/GRANITE TOPS & LOVELY VIEWS TO THE POOL & GOLF COURSE. MASTER RETREAT W/ DOUBLE DOOR ENTRY, CHANDELIER,SITTING AREA W/ GREAT VIEWS & HUGE WALK-IN CLOSET W/ BUILT-INS.MASTER BATH OFFERS WRAP AROUND VANITIES,SPACIOUS WALK-IN SHOWER W/ SITTING AREA & GARDEN BATH.DEN/STUDY OR 4TH BDRM HAS DECORATIVE TRAY CEILINGS,PLANTATION SHUTTERS & WOOD FLRING.HUGE 2ND & 3RD BDRMS FEATURE SPACIOUS CLOSETS & DECORATIVE WINDOW TREATMENTS.OUTSTANDING POOL W/ ROCK WATERFALL,BRICK PAVER DECKING & TROPICAL LANDSCAPE.HOME OFFERS EXCELLANT VIEWS OF NUMBER 7 GREEN ON THE HIGHLY SOUGHT AFTER SOUTH COURSE.INNISBROOK RESORT IS A ONCE A YEAR STOP FOR THE PGA MENS TOUR.THE RESORT OFFERS 4 GOLF COURSES 6 COMMUNITY HEATED POOLS INCLUDING THE FABULOUS LOCH NESS POOL,FITNESS CENTER,TENNIS AND MORE! Directions: ALT. 19 (JUST NORTH OF ALDERMAN RD.) TO RIGHT TO GUARD GATE ENTRANCE INTO HIGHLANDS OF INNISBROOK . LEFT ON PLAYMOOR DR.